Immerse your skin with intense hydration using Radiance Recovery natural Night Cream. This rich, organic, velvety cream boasts a potent blend of natural moisturisers to nourish, replenish and protect your skin whilst you sleep, without it feeling heavy on the skin. 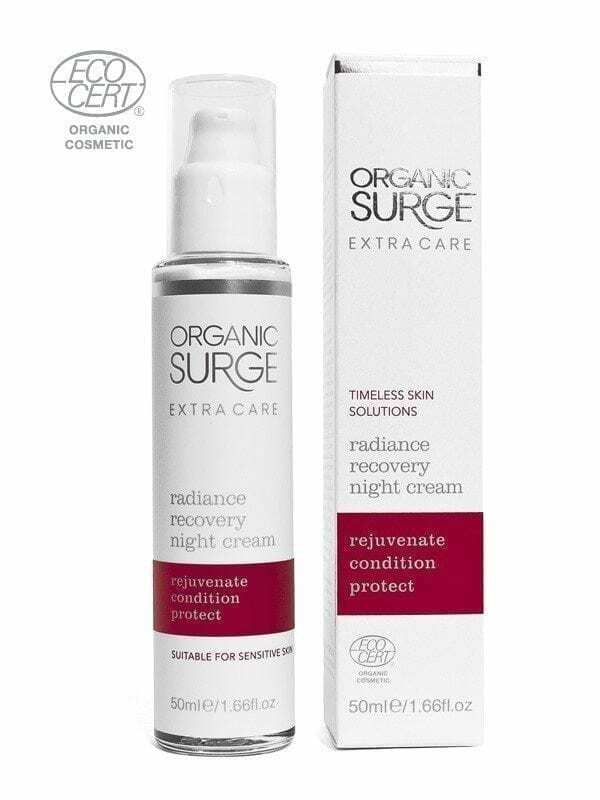 Organic Surge’s Extra Care range features natural creams, moisturisers and lotions that will nourish your skin and enhance timeless beauty. Enriched with anti-inflammatory Safflower oil, an ingredient known to help smoothe and soothe dry skin, as well as many other powerful botanical extracts, this natural cream will help to hydrate and protect your skin from environmental damage. A rich source of vitamins, Argan oil has been valued for its moisturising properties, and this multi-purpose oil is known to revitalise dull and lack-lustre complexions. For healthy looking skin, you need to get plenty of rest so that your skin can renew and rejuvenate itself. This overnight treatment has been formulated to work as you sleep, conditioning and replenishing the skin to provide action that may help to reduce the visible line of wrinkles. Before you go to sleep, apply to cleansed skin by massaging into your face and neck using gentle upwards strokes. For a super charged treatment add a few drops of Replenishing Facial Oil as you apply the cream.